Open - open another science program from the local database into the current science program editor window. (To open into a new window use the File...Open in New Window menu item). Prev / Next - navigate between science programs that are open in the current science program editor window. Back / forward - navigate within the current program. Cut, Copy and Paste observation elements (the same functions are available in the right-click menu within the science program viewer and from the edit menu item). The Paste feature will insert the contents of the Cut/Copy buffer into all selected observations. Plot - plot elevation, airmass, timing constraints, or parallactic angle vs. time for the selected observations. By default the date is the date when the OT was started. The date can be changed by selecting Date from the View menu. 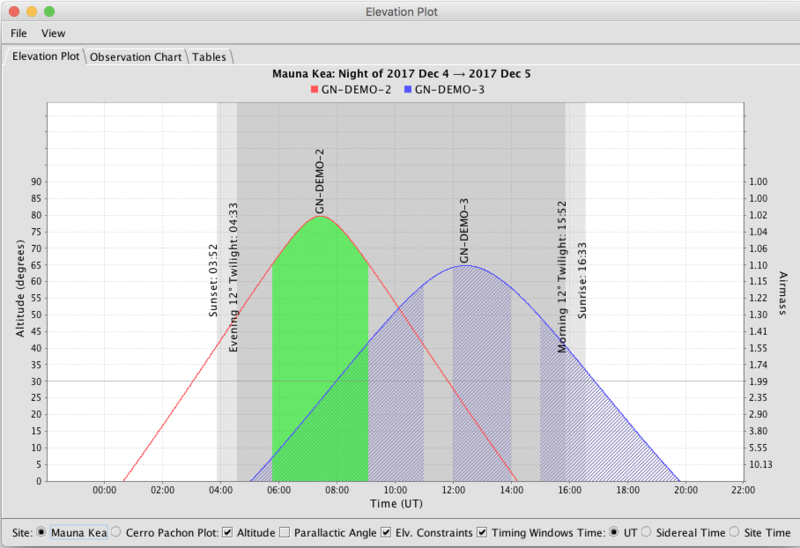 If an observation has elevation and hour angle constraints and the Constraints box is checked, then time that matches the constraints is indicated by the filled green area under the curve. If the observation has timing windows then they can be viewed if the Timing Windows checkbox is checked. In this case the timing windows correspond to the areas under the curve. The dark grey shaded area denotes the time between nautical (12 degree) twilights. The light grey bands indicate the times between sunset/rise and nautical (12 degree) twilights. Image - open the position editor graphical display. Libraries - automatically fetch (if not already in the local database) and display example libraries for the program in a new window. This will not check for updated versions of libraries that have already been dowloaded. To manually fetch the latest versions of the libraries, select Fetch Libraries... from the File menu. Apply - apply 2012B and later template observations to Phase 1 targets and conditions. The templates will be copied and new observations will be created with target and conditions components added for observations of class Science or Acquisition. Calibration observations will be copied but the targets and conditions are not updated. Reapply - reapply 2012B and later template observations to exisiting observations that were created using the Apply templates feature. Conditions, targets, and the position angle (PA) are not updated. Conflict - cycle through any unresolved conflicts. See the Conflict section for more information. Your program is in sync with the Gemini database. You may click this button to check for remote changes. You have made local changes to your program to which have not yet been uploaded to Gemini. Click this button to upload them now. There are changes to your program in the Gemini Database which have not been downloaded. Click this button to download them. Your program has changed in the Gemini Observing Database and you have made local changes to your local program. Click this button to download the changes from Gemini and to upload your changes. Note that merging changes may result in a conflict. The current program does not exist in the Gemini Database. The Gemini Observing Database could not be reached. You may click this button to try to reestablish a connection.